Roxy and Dukes in Dunellen usually presents pretty earthy, straightforward music — blues and country and rockabilly and hard-rock — as well as the occasional burlesque show. But it also hosts the NJ Proghouse series, devoted to the more sonically adventurous sounds of progressive rock. The next show in the series takes place Saturday, and features The Levin Brothers (led by bassist Tony Levin of King Crimson, and his piano-playing brother Pete) and the New Jersey quartet, Stratospheerius. 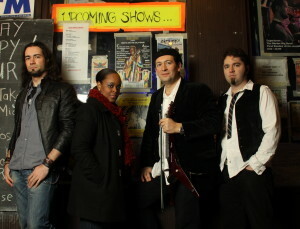 Stratospheerius was originally formed in 2001, and has released four albums since then. It improvises like a jam band in concert, and its latest single, “Guilty of Innocence,” is as catchy as is is forward-looking, with echoes of The Police and Talking Heads. 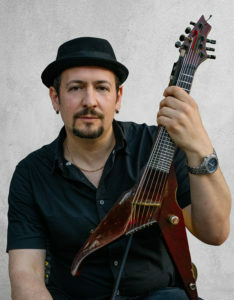 In the current lineup, Deninzon is joined by guitarist Aurelien Budynek, bassist Jamie Bishop and drummer Lucianna Padmore. The band’s name, by the way, is a play on Stradivarius, the name for the highly regarded violins and other string instruments made by Antonio Stradivari and other members of his family in the 17th and 18th centuries. Deninzon is also doing a lot of writing these days, having been commissioned to compose a piece for violinist Rachel Barton Pine, and having premiered an electric violin concerto with the Muncie Symphony Orchestra in Indiana in September. He also is doing some prog rock organizing, putting together a traveling festival, Sonic Voyages, that hits New England in May and may come to New Jersey at some later point. He believes this is a good time, in general, for progressive rock. “I see a lot of mainstream acts incorporating elements of prog music, even though they’re not known as prog acts. The last few Coldplay albums, there was some really interesting stuff going on with arrangements and time signatures and production. Muse is a band that really blew up, especially in Europe, and became a mainstream act that had hits, but they’re really, technically, a progressive rock band in a lot of ways.